If you are looking for children’s books about Passover, Happily Ever Elephants has just the list for you, whether you are reading to children who celebrate the holiday or teaching children who have never experienced Passover’s beautiful traditions. Check it out! Fabulous Children’s Books About Passover! With Spring upon us, it is almost time for Passover! There is no better way to celebrate a holiday — or to teach children about a holiday they do not themselves practice— than through fun, festive or beautiful books. Children’s books about Passover are definitely something to celebrate! Jewish holidays are celebrated by so few people around the world. Yet there are many wonderful stories that will engage Jewish children as they prepare for these important days and teach non-Jewish children about this vibrant religion and the traditions Jews embrace as they prepare for and celebrate their holy days. Passover is the story of how God brought the Jewish people out of Egypt, where they had been enslaved and forced to do hard labor by Pharaoh. Moses repeatedly went to Pharaoh and sought permission to let the Jewish people go. But Pharoah continually refused, even when Moses warned him that God would smite Egypt. And so it was that God brought ten plagues upon the Egyptians until Pharaoh finally agreed to let the Jewish people leave. But the Jews had to leave quickly — so quickly, in fact, that they did not have time to let their bread rise, and the only food they brought with them was unleavened. During their exodus from Egypt, the Jews were trapped between Pharaoh’s armies and the Red Sea. Miraculously, the sea split, allowed the Jews to pass through, and closed back up over the Egyptians. The Jews were free! The Passover holiday begins with a Seder, a feast that includes reading from the Haggadah, drinking wine, eating symbolic foods, singing songs and storytelling. During the Seder, children and adults alike are supposed to feel as if they, themselves, were Jews in the land of Egypt: performing hard labor, experiencing the plagues, and then fleeing quickly out of Egypt and across the Red Sea. Among other things, participants are encouraged to recline to symbolize their freedom, drink wine to symbolize happiness, and eat matzah to commemorate the Jews fleeing Egypt without having time to let their bread rise. The Passover Seder is one of the most beloved rituals on the Jewish calendar, and every family incorporates their own unique traditions into their celebrations! Children’s Books About Passover Worth Celebrating! These children’s books about Passover are fabulous! Whether you’re reading to your own kids to reinforce their knowledge of the holiday, or looking to teach non-Jewish kids about Passover to bring diversity into your home or classroom, these are the books you do not want to miss! With easily accessible themes, such as inviting all who are hungry to come and eat, fostering empathy for the plight of others, and encouraging young children to speak up and ask questions, Passover revolves around universal talking points from which all children (and adults!) will enjoy thoughtful conversation. Enjoy! My First Passover, by Tomie dePaola: “Why is this night different from all other nights?” Through simple text and child-friendly illustrations, this is the perfect board book to teach the youngest children about Passover. Kids will learn about the Passover meal and ceremony called the Seder, as well as the special foods we eat and the book we read during the holiday. 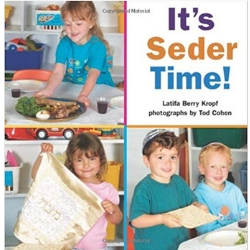 It’s Seder Time!, by Latifa Berry Kropf and photographs by Ted Cohen: Did you know young children love seeing photographs of real kids in books? In this perfect book for your preschoolers, children in a Jewish school prepare for the holiday, participate in a Seder, and even act out the Passover story with classmates. Bonus? This children’s book about Passover includes directions to make a Torah mask! What Am I? Passover, by Anne Margaret Lewis and illustrated by Tom Mills: This is another book we absolutely love for the younger set! Why? It’s a Passover guessing game, with flaps to boot! Kids will love this lift-the-flap book that allows them to guess all of the symbolic objects that make Passover special. From matzah to candles, this one is such fun! 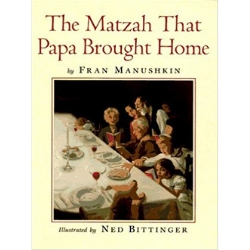 The Matzah that Papa Brought Home, by Fran Manushkin and illustrated by Ned Bittinger: This children’s book about Passover will forever be a favorite of mine. It is a cumulative story, which makes it a cherished read aloud in our library. Why? Because children love chiming in, and the lively versus enable them to read right along with me! This beautifully illustrated book includes an explanation of both the Passover story and the symbolic items at the Seder, and we just can’t rave about it enough! On Passover, by Cathy Goldberg Fishman and illustrated by Melanie W. Hall: This is a gorgeous children’s book about Passover! It is one we especially love for the way it encourages kids to use their five senses to experience the holiday like never before. There are important stories to hear, Seder plates to see, soup to smell, foods to taste and pillows to touch. As the child follows her senses, she discovers the heart of Passover and gains a new understanding as to why the holiday is so important to her family and the Jewish people. 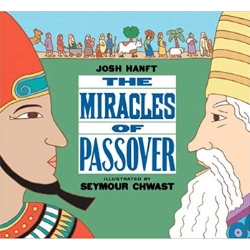 The Miracles of Passover, by Josh Hanft and illustrated by Seymour Chwast: This great picture book offers a retelling of the Passover story, including the exodus of the Jewish people from Egypt. It also explains the traditions of the Seder, both historical and modern, including a great description of the Seder plate. Most importantly? It has flaps, which make this book come alive! The Longest Night: A Passover Story, by Laurel Snyder and illustrated by Catia Chien: This book is exquisite! Told through the eyes of a child slave, this picture book in verse follows her story. It tells the story of Pharaoh, Moses, the plagues, and the parting of the Red Sea in a lyrical, gentle and beautiful manner. This is such a unique and evocative book about the holiday, making it one of my very favorite children’s books about Passover. An absolute beauty. Holidays Around the World: Celebrate Passover with Matzah, Maror and Memories, by Deborah Heiligman: A Happily Ever Elephants book list wouldn’t be complete without books showcasing how Passover is celebrated around the world! This fabulous book gives us a glimpse of how Jewish families and communities around the globe, including in China, Yemen, Uganda and Budapest, enjoy their Seders and celebrate this special holiday! Passover Around the World, by Tami Lehman-Wilzig and illustrated by Elizabeth Wolf: This is another fabulously engaging book that describes Passover celebrations worldwide! While the Passover story remains the same whether in MIami or Morocco, the customs and traditions vary widely from city to city and country to country. This informative book provides children with glimpses of the manner in which Passover is celebrated in America, Ethiopia, Gibraltar, India, Iran, Israel, Morocco and Turkey, making it a fantastic addition to any child’s bookshelf. Children’s Books About Passover: Fun Stories! Izzy the Whiz and Passover McClean, by Yael Mermelstein and illustrated by Carrie Hartman: If you want to incorporate STEM into your child’s Passover reading, this is the book for you! Izzy the Whiz is a kid inventor, and right before Passover he comes up with one heck of an invention to help his mom - a super machine that will clean the house and get rid of any Hametz (leavened food that is prohibited during the seven days of Passover). But there’s one problem — will his invention actually work, or will it leave the house upside down and inside out? The Matzah Ball Fairy, by Carla Haymsfeld and Vlad Guzner: I don’t know what it is about this silly book, but I just adore it, and so do my kids and students! 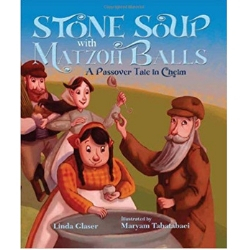 This is the tale of Frieda Pinsky who tries oh-so-hard to make the perfect matzah balls for Passover seder. But her skills are not up to task, and she needs some help! Matzah Ball Fairy to the rescue. But what happens when Frieda adds some of the fairy’s magic powder to her matzah balls? Well, let’s just say that the matzah balls aren’t the only things that get light and fluffy — the family does too! A Sweet Passover, by Leslea Newman and illustrated by David Slonim: Miriam loves when Passover arrives, especially the thought about eating matzah for seven days! She eats it every which way imaginable, but on the morning of that very last day, she wakes up and decides she is so sick of matzah, she can never eat it again. But then? Grandpa makes his world famous matzah brei — and Miriam may just discover that there is a lot more to Passover than matzah! 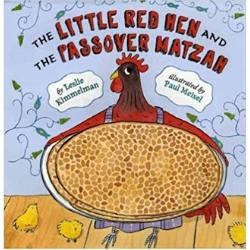 The Little Red Hen and the Passover Matzah, by Leslie Kimmelman and illustrated by Paul Meisel: Little Red Hen asks her pals on the farm to help her make matzah, but they all refuse. Then she asks them to help her plant grain, and again they refuse. This trend continues, and the Little Red Hen gets all ready for Seder by herself. When her friends show up at her door and ask to join the Seder, whatever will she do? Should she invite them in, even though they gave her no help? This is another great children’s book about Passover, highlighting the notion of letting all who are hungry come and eat, even if they may have hurt us in the past. The Passover Parrot, by Evelyn Zusman and illustrated by Krysten Brooker: Lily gets to say the Four Questions at Seder this year, and she can’t wait. But no one will help her practice the four questions in Hebrew… until, that is, Hametz the Parrot arrives in their house! Hametz not only helps Lily practice, but he may just steal the show… and the afikomen! Your kids will love this fun story about one brilliant bird! DID YOU LIKE THIS LIST OF CHILDREN’S BOOKS ABOUT PASSOVER? We think you will love these too! Favorite Children’s Books About Hanukkah!